I've had them and they are pretty good. I also like flat out lights and Mission Carb Balance tortillas (my go to product). Another good alternative bread product is Josephs Pitas in the low carb version. I cut them into triangles and bake them in the toaster for home made pita chips. 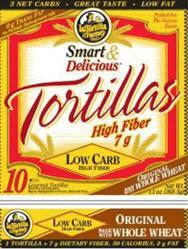 I also do that with the Mission carb balance tortillas to make baked tortilla chips. A nice summer wrap is hummus, red fat feta and tons of chopped veggies. Keep the food suggestions coming I love it!!! Thank you for the recommendations on the other great products. I too love the flat out lights however they haven't been carrying them at my local grocery store lately for some reason. Hummus and veggie wraps are great! - I need to rotate my menu options a little and I forgot about that one. Thanks for reading and posting.